Here’s why, if your property needs to have some does lopped off it this year, early is better than later. Gentlemen, let’s talk. Do you have a woman problem? You know that putting off solving the problem will only make it worse, right? So man up and let’s get it taken care of sooner rather than later. No, I’m not talking about your spouse, or your girlfriend. I’m talking about having too many does on the property you hunt. When the deer density exceeds the ability of the habitat to support those deer, you’re going to have to kill some does. If you’ve done your homework know about what that number is, the only question is when to get it done? In my view, it’s almost always better to shoot your does early in the season rather than later. I like to use the early archery seasons as my time for putting does in the freezer, primarily because it allows me to hunt them on food plots in the afternoons. One thing I never, ever do is shoot does off food plots with firearms. When you start banging does with guns on food plots, the next thing you know, they don’t visit them during daylight hours any more. By hunting them as you would an old buck, using a silent archery tool, the survivors aren’t bothered at all. Here are my Top 10 reasons to hunt does early. 10. When your focus is on mature bucks — not meat in the pot — during pre-rut and rut periods, you won’t have to worry about spooking those mature bucks hanging near or with does. 9. Few among us have shot enough big game animals that mistakes aren’t made as a shot opportunity approaches, then arrives. Heck, truth be told, even though I have killed literally hundreds of deer with my bow, my leg still vibrates like a jackhammer when any deer comes into range that I know I’m going to shoot. Taking your does early will help get you back in the groove as serious, buck-hunting time get closer. 8. Early in the season, all deer — including does — have yet to start feeling the pressure that big crowds bring when the orange army hits the woods for opening day of gun season and the rut. 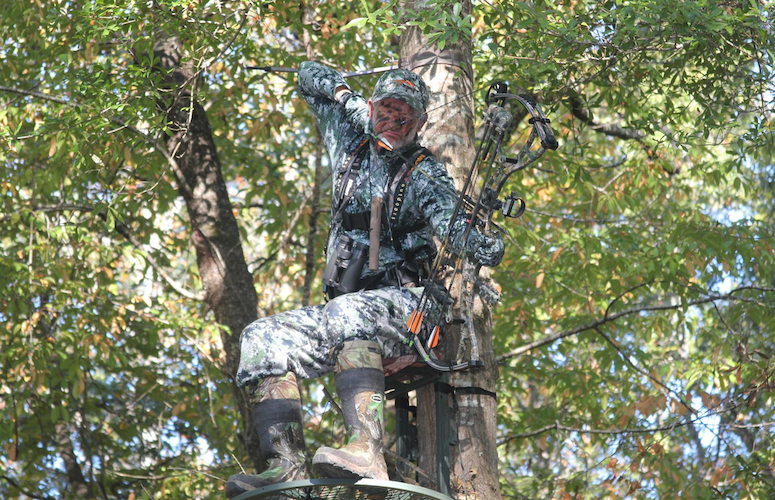 And by the late season, does may be as wary as bucks, making them much harder to harvest. 7. In late summer and early fall, buck fawns (button bucks) are still relatively small compared to mature does, and the difference in body size makes them a bit easier to identify and, thus, makes it easier for you to not shoot a young buck by mistake. Later in the season, button bucks may be as big as adult does. 6. When I shoot does early on, I have lots of time to turn that meat into quality summer sausage, meat sticks and the like. As the rut gets close, I want to be in the woods every free moment I have, which means any deer I shoot then will be frozen until later. One reasons does are great to take at the beginning of the season is they don't feel pressured yet. 5. If you belong to a hunt club or have partners in a lease, most everyone gets jacked up two times during the year: opening weekend, and during the rut. So opening week you’ll have plenty of shooters in the woods, which will help meet your property’s management goals. 4. Spending time in the woods early on will help you get a new “feel” for the property, how the deer are using it, the quality of the browse, water and your food plots. You might locate new trails leading to and from bedding thickets to food sources, find a tree that’s tipped over, or notice that the acorn crop this year looks like it’ll be big -- or not. It’s all valuable data to feed into your planning for later in the season. 3. There’s also no pressure to kill does early in the season. Sure you want to meet management goals, but in September and early October you know you still have several months to get it done. That means you can take your sweet time in selecting exactly the does you want to harvest. Also, since you have lots of time to look ‘em over, you can make doubly sure you are not shooting a button buck by mistake. 2. There’s no better time to teach young and/or novice hunters the ropes than on an early-season doe hunt. Because you can hunt afternoons on a food source, they don’t have to get up before daylight, and they’ll probably see plenty of deer and other wildlife. The weather isn’t bitter cold, either. They’ll learn what to look for, how important it is to watch the wind and sit still, and how to wait for exactly the right moment before taking a shot. And if they make a mistake and the does get spooked? So what?? The season is long and we’ll come back another day. 1. Shooting does before the rut kicks in changes your property’s buck:doe ratio, which in turn can help intensify rut competition. This can make bucks more visible and the use of exciting rut hunting techniques like rattling and calling and using attractant scents more effective. This all makes hunting more exciting and fun! When do you like to harvest does? Do you take your children and spouse along? Share your thoughts with me at brobb@grandviewmedia.com. I’d love to hear from you!